magnificent obsession: Award and Anna's giveaway! Anna here is hosting a WONDERFUL giveaway! Click HERE to see! Oh, and Johanna awarded me! Thank you Johanna! And now I will award this to: Anna, Megan, Grace, and Jess. You guys are great friends! Thank you, thank you thank you thank you thank you thank you!!! Your book arrived safely in yesterday's mail, and I was so happy to have a new book to read because I was really pretty sick yesterday:( Reading Alone Yet Not Alone occupied my time:) I read the WHOLE thing in one day, it was so enthralling. Thank you so much, Kendra! 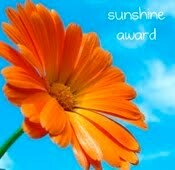 And thank you for the award too:) Hope you are having a wonderful day! You write such great stories! Keep it up!